"With the success and growth of Kunststoff Schwanden AG, new challenges have cropped up in recent years. In particular, the increasing customer requirement to be on the ground as a supplier in important economic regions such as China, Mexico and the USA, highlights the need to internationalise our production sites. In addition, the time had come to arrange my succession, to pave the way for the continued success of the company and thus to take responsibility for our many workplaces. I am very pleased to have found a business partner in Bregal. This is a perfect fit, not only because of their international experience which is beneficial to Kunststoff Schwanden AG, but also because of the long-term perspective that makes up part of the company's culture, which has been built up over generations by the Brenninkmeijer family," stated Albert Kiener. "Kunststoff Schwanden AG is well positioned on the market and we see great potential for further successful development. 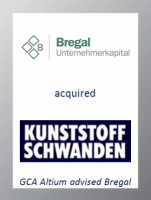 That is why we are making a long-term commitment and are bringing in our extensive expertise to support growth and for succession situations in medium-sized companies," commented Florian Schick, Managing Partner of Bregal Unternehmerkapital GmbH. Bregal's international network of industry experts and vast experience in the automobile segment will also provide a valuable contribution towards this goal. Bregal's investments include the automobile supplier, Novem Car Interior Design, based in the Upper Palatinate (producing decorative trim parts for vehicle interiors), and Binder-Group (external aluminium trim parts and roof rails) based in south-west Germany.